I have been trying to pay more attention to the indie titles as of late, you know, do my part to support those that work in the hobby I love. This week I picked up Dungeons of Dredmor on a wonderful Steam sale, 70% off. A game would have to be quite horrible to not even be worth the simple $2.25 I paid for it and its expansion pack, thankfully DoD well exceeds my expectations. 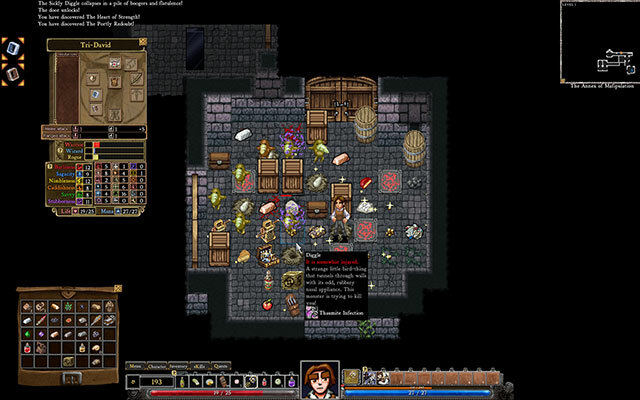 Dungeons of Dredmor is a 2D roguelike dungeon crawler but with an added wicked sense of humor. In fact, it is that sense of humor that has kept me playing the game. I have uncovered so many small jokes or references that I keep going forward to see what else I can uncover. I have thus far encountered references to The Secret of Monkey Island, Conan, Evil Dead and just so many other things that the game has endeared itself to me. For the jokes and attitude alone I find the game well worth the price. Complexity wise, DoD is actually quite involved. The game very much follows the basic formula of RPG style games with attributes that increase/decrease based on equipment and such, and skill points are allocated to purchase new skills each level. You do not pick a class in the traditional sense, but you do start by picking a set number of skills which pretty much determine your class. Combat in DoD is turn based and adds another layer of tactics to the game. When facing several batties (an actual name of creature) I can choose to face them head on or funnel them into a tight hallway then unleash a fire strike that engulfs the lot of them. The levels in DoD are vast, expansive and completely random, so when you die you can start over and not have that horrible experience of running the same content again over and over. And die you shall. The game seems quite simple and easy in the beginning but as you descend deeper into the dungeons things become much more difficult. Dungeons of Dredmor is not breaking any new ground in gaming for sure, but what it does do is make me laugh out loud and that is something I will gladly pay a few dollars for.